peaks out from behind her skirt. He felt impossibly light. At 6-months-old, Stevenson Louis should have been a pudgy, smiling, playful infant. He should have been sitting on his own, or close to it. Instead, he was as weightless as a newborn cradled in my arms. His dark chocolate eyes stared up at me vacantly, his face expressionless and somber. I wanted nothing more than to make him smile. But I doubt he’s done that much in his short, difficult life. 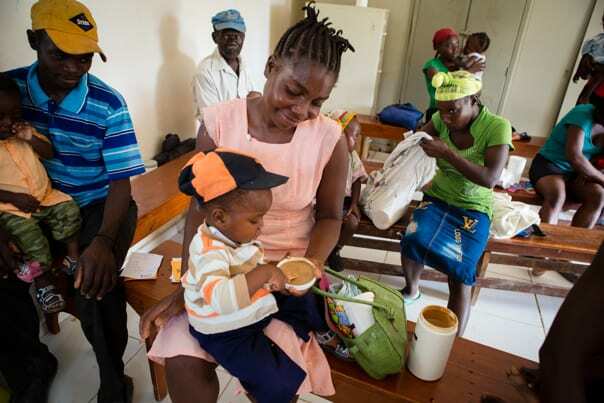 His mother, Manise Darius, handed me Stevenson as soon as she walked into the malnutrition clinic in Boucan Carré, Haiti. We’d met the day before during a home visit. Still, I’m not sure why the 26-year-old mother entrusted me with her son. Maybe her arms needed a break following the long walk from her house to the clinic. Or maybe she’d read my mind and knew how much I missed holding my own son, whom I’d left—fat and happy—back in Boston only days before. 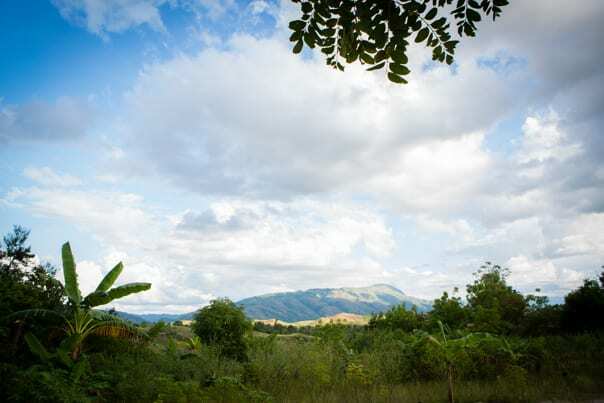 The view behind Darius's home. 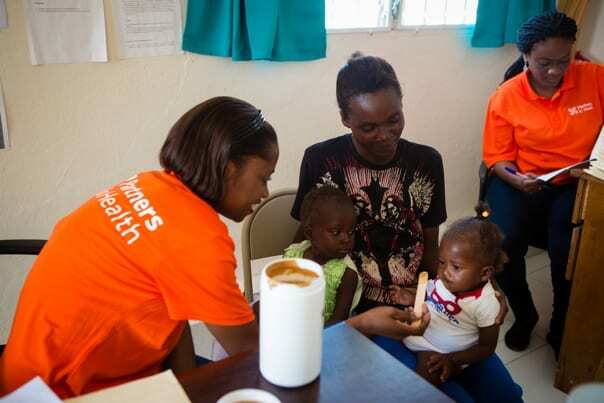 I traveled to Haiti in November to report on the malnutrition program run by Zanmi Lasante, as Partners In Health is known in Haiti. As part of the trip, I and several PIH colleagues made home visits to families enrolled in the program, observed care at two malnutrition clinics, and had a tour of the Nourimanba production facility, where PIH produces a nutrient-rich peanut paste fed to malnourished children at 12 health facilities throughout the Central Plateau and lower Artibonite. On our first reporting day, we visited three families in and around Boucan Carré. Darius was the second mother we met, and by far the worst off. 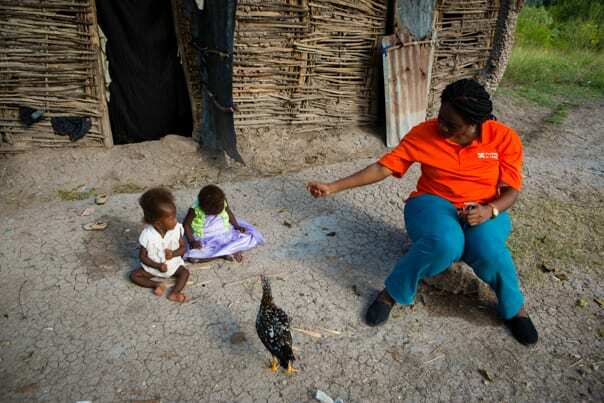 Although her 2-year-old daughter, Ferlanda Louis, was the only one of her children enrolled in the malnutrition program, it was clear Stevenson would benefit as well. 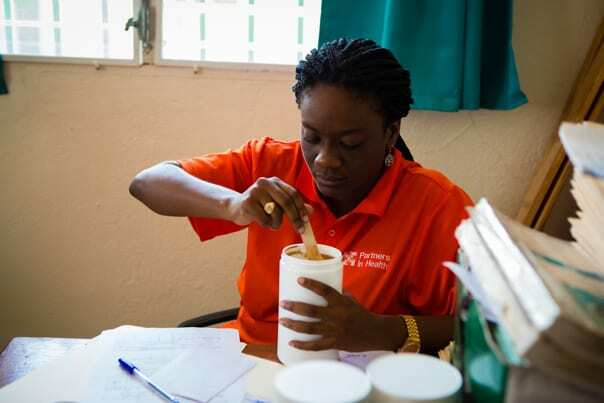 Ms. Esther Mahotiere, a nutrition program coordinator, and Ms. Asmine Pierre, lead nurse of the clinic’s malnutrition program, encouraged her to come to the clinic to have them checked out. at the malnutrition clinic in Boucan Carré. That was easier said than done. 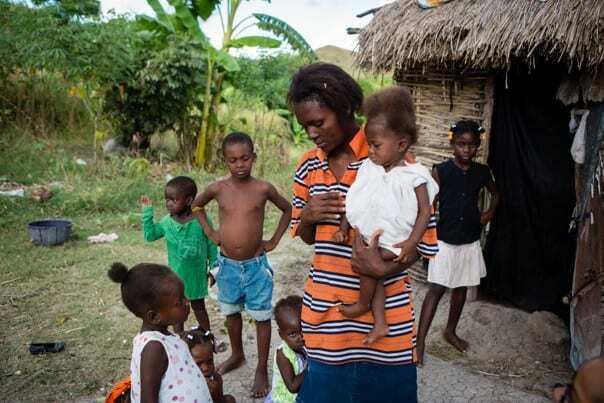 Darius lived several miles outside of Boucan Carré, had three other children at home, and her husband was rarely home because he—like many men in the area—worked hours away in Port-au-Prince. She didn’t have enough money to feed her family on a daily basis, much less pay for a motorcycle ride into town. So when Darius arrived in the clinic that Tuesday morning with little Ferlanda hugging her right leg and Stevenson on her left hip, I couldn’t help but smile. She’d made it. She’d come. She was trying, despite all the odds stacked against her. After handing me Stevenson, Darius and her daughter found a spot on the wooden benches inside the packed clinic. Ferlanda had on the same purple and green princess gown she’d worn the day before and was slowly nibbling the periphery of a wafer cookie. It was one of the treats packed into the bag of food we delivered to her family’s home less than 24 hours ago. Darius handed another package of wafers to the toddler sitting beside them. The boy clutched it in his hand, content just holding the rare treasure. It was barely 9:30 a.m., and the air already hung heavy and stale in the clinic. Mahotiere, Pierre, and two nursing students tended to the flow of women and men who’d come with children in various stages of starvation. That’s a harsh word—starvation. But there’s really no substitute that can adequately describe what happens to a fragile, growing body when it receives one meal a day—if even that—over an extended period of time. When children don’t get enough to eat, they fail to gain weight and height at a proper pace. Their hair becomes brittle and turns a coppery hue. They’re more likely to get sick and have a harder time healing. Severe acutely malnourished children may develop a condition called marasmus, in which an overall nutritional deficiency causes them to waste away and look more like human skeletons than rough-and-tumble toddlers. They could also develop kwashiorkor when deprived of protein. Their hands, feet, face, and even scrotum can become painfully swollen. Their bellies distend like overinflated balloons. These are the physical signs of starvation, but there are also mental repercussions that are equally alarming. Children’s brains fail to develop at a proper pace, making it more difficult for them to learn and concentrate. All of these factors combine to set children severely behind their peers—potentially for the rest of their lives. It was the first visit for some children visiting the Boucan Carré clinic that day. For others, it was one in a series of weekly or bimonthly visits, all depending on whether they were severely or moderately malnourished. 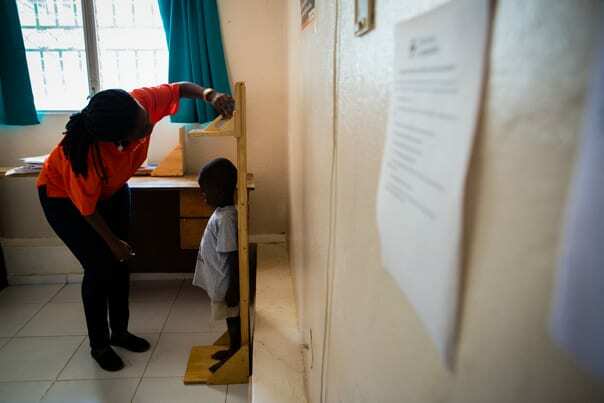 Nurses measured the children’s height, weight, and upper arm circumference—which provide clues to the degree an infant or toddler is malnourished—and jotted the numbers down in their charts. Then each child and guardian sat down with a nurse for an individual consultation and were sent off with a fresh supply of Nourimanba. 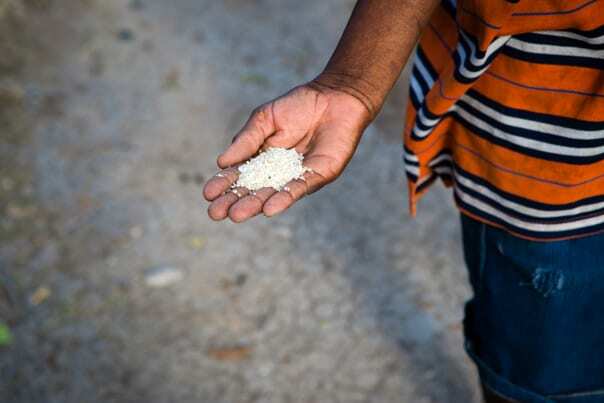 Roughly 1 in 5 children are starving in Haiti, and twice as many are stunted. Not all of them receive the care they need, but some do make it to PIH clinics and get enrolled in a malnutrition program. 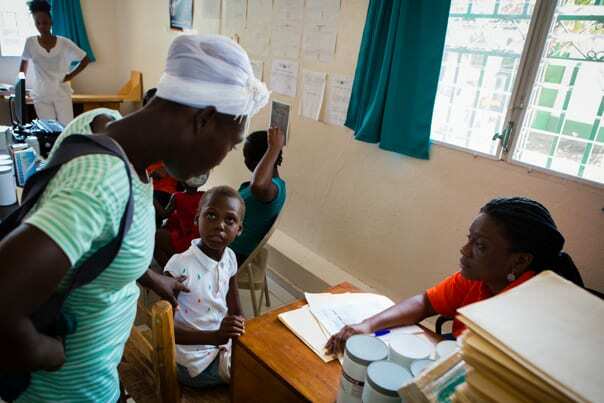 In Boucan Carré, an average of 127 patients visited the clinic every month and nearly 700 patients enrolled last year alone. 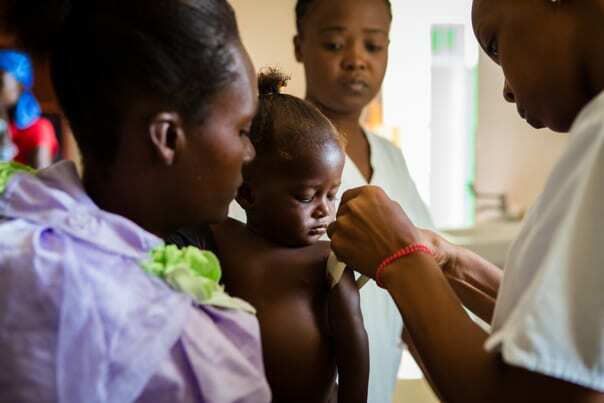 That was just a fraction of the 9,000 children suffering from malnutrition whom PIH helped at its clinics and hospitals across the country in 2016. I’d been holding Stevenson for half an hour when I realized I’d have to let him go to do my job. I tried one last time to make him smile by tweaking his cheeks, then swaying side-to-side as if he were my tiny dance partner. His face remained unchanged, his eyes still locked with mine. Other mothers watched and smiled softly to themselves. Reluctantly, I handed him—slender and warm—back to his mother. Mahotiere, a kind and no-nonsense nurse, sat at a wooden desk behind a wall of manila folders. She searched through the pile, called out a name, and waited for the child and guardian to take a seat on the plastic chair beside her. Jelciné Marie Lourde and her 18-month-old son, Ocléne Davensky, took their turn. 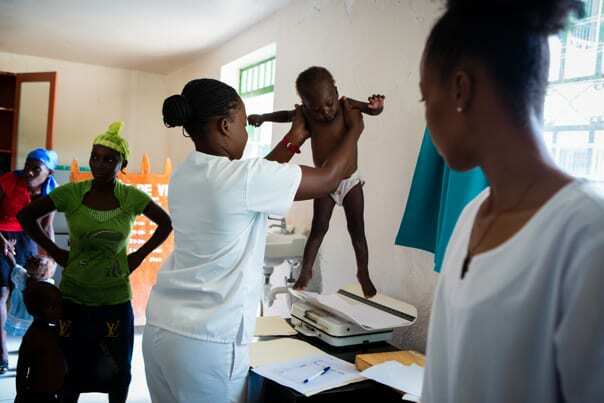 In the two months since he was enrolled, Ocléne had gained 4 pounds and weighed nearly 18 pounds. According to the Centers for Disease Control, an average boy his age should be 27 pounds, yet the fact that he was gaining weight was a positive sign. As she chatted with the boy’s mother, Mahotiere opened a jar of Nourimanba, dipped in a wooden tongue depressor, gave the thick slurry a swirl, and scooped a small dollop out for Ocléne to taste. Clearly, he was a fan. His mouth opened wide to accept the peanut paste. Youseline Benjamin sat down next. She seemed older than the rest, but it was hard to judge ages when, uniformly, every child looked younger than what their chart read. She, shockingly, was 11. She had been enrolled on August 30, 2016, weighing just 38 pounds. Other girls her age should be at least twice that size. It hit me that my 8-year-old daughter, who is average for her age, weighs 60 pounds. Youseline Benjamin, 11, sits for her consultation with Mahotiere. Since enrolling in the malnutrition program, Youseline has gained 9 pounds. Her only complaint that morning was of a mild rash on her belly. Mahotiere examined her and jotted down a prescription to fill at the nearby pharmacy. A slight stir rose in the room around a mother perched on the front bench. She was holding her daughter gingerly over her lap. The toddler’s shirt slid up to reveal what looked like white and yellow scales where there should have been brown skin. Pierre asked the mother what had happened, and learned that the little girl had fallen backward into an open fire. By the look of the girl’s skin, the accident had happened days—if not weeks—ago. The nurse sent mother and daughter to urgent care with instructions to have clinicians tend to the severe burn. Meanwhile, Claudia Louis and her 2-year-old son, Kendy Michel, took a seat alongside Mahotiere. Kendy had just been enrolled the week before, but he had already developed a taste for Nourimanba. The nurse checked his temperature and gave him a sample of the peanut paste. Kendy couldn’t get enough. His jaw unhinged as wide as a baby bird’s with each helping. Then, while his mother gathered up their things, he continued shoveling the paste into his mouth from one of two tubs they took home. He cried pitifully when his mother finally closed the jar, shushing him apologetically as she scooped him into her arms. Kendy Michel, 2, sits on his mother’s lap and shovels Nourimanba into his mouth. My colleagues and I couldn’t get enough of Kendy. He attacked his tub of Nourimanba with such zeal that it was hard not to love him. He stood out from the other children, who sat lethargic and moon-eyed as they waited their turn in the crowded clinic. Each child made me think of my own three back home. I realized that the first thing I wanted to do when I returned was to cook a meal for my children, watch them clean their plates, then repeat the process endlessly. Sitting at a desk beside Mahotiere’s, Pierre started new files for Ferlanda and Stevenson as the children perched on their mother’s legs. Because Ferlanda had missed two appointments in a row, she was categorized as having “abandoned” the program. Darius explained that she had intended to come, but that Stevenson had been sick. She had no one else to rely on, so they had to stay home. Most children graduate from the malnutrition program after completing three months of appointments and Nourimanba supplements. They gain weight and grow inches taller. They begin reaching major development milestones, such as sitting, crawling, walking, and talking. In other words, they begin to do what children their age are supposed to do. Some don’t reach these milestones the first time around. 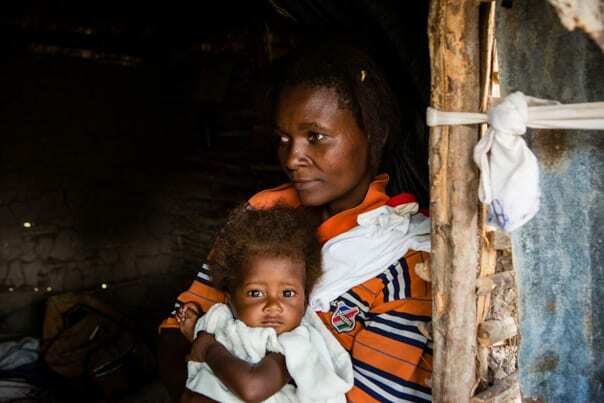 Their mothers, like Darius, are peasant farmers who raise their own food and sell what they can in the market. Sometimes crops fail. Droughts strike. Floods wipe out fields. And husbands fail to send home what they’ve earned at jobs miles away in the city. That means there is very little money for anything, and families must make painful choices between food or transportation, clothes or medicine. that she buys and prepares for her children. So when parents or guardians don’t arrive for appointments at the malnutrition clinic, their absence is never mistaken for lack of love or compassion. They know their children are starving. Quite often, they are too. PIH’s malnutrition staff understand this intimately. When families eventually return to the clinic, they don’t browbeat parents or guardians. They simply grab another intake form and start the process over. Again. And again. And again. For as many times as it takes to pull that child out of starvation and place them on the path to a healthy future. I watched Pierre as she measured Stevenson’s upper arm, his dark eyes following solemnly her every move. I took in his brittle, rust-colored hair that Darius had tied into a neat sumo ponytail. I glanced at his spindly arms and legs that hung limply from a white onesie. And I wondered if he would make it. I couldn’t bear the thought of him not. Pierre offered Ferlanda a taste of Nourimanba, which she licked delightfully from her lips. Then it was Stevenson’s turn. His delicate mouth opened and closed over the wooden tongue depressor. Then the faintest of smiles lit his face. Darius holds Stevenson in the doorway of their home, made from mud, sticks, and corrugated metal.